Takk for at du har logget inn! Sett i gang med å lære norsk! with the Sett i gang curriculum! Our website is free, but students and teachers must create an account. 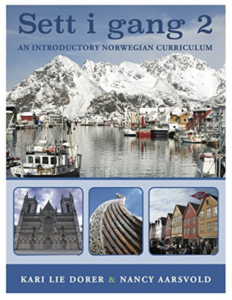 This web portal is a companion site to the introductory Norwegian textbooks Sett i gang 1 and Sett i gang 2. Serving as a digital workbook, the web portal includes audio files for the texts in the books, online flashcards for the vocabulary introduced in the chapters, interactive exercises related to grammar and other topics from the books, and online video clips. In addition, there are many extra resources for instructors. The site is free for everyone, but you will need to create a free account and log in below. Once you have created an account and logged in, you can explore the main learning resources that comprise the web portal by clicking on the icons below or on the main menu at the top of the page. Once you have created an account and logged in, use the links below or the main menu at the top of the page to explore the main learning resources that comprise the web portal. The Sett i gang textbooks are the core of the introductory Norwegian curriculum, which is designed for self-study learners and students in the first year of university courses or the first two years of community education and high school classes. 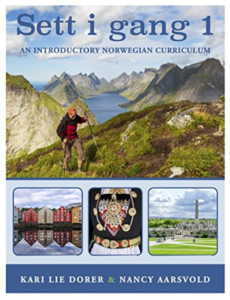 The textbooks are brimming with full-color images of Norway, diverse texts, and numerous learning activities that engage students in exploring contemporary Norwegian language and culture from the very first chapter. To see the book for yourself, download the free pdf files of Ch. 1 and Ch. 16. The print textbooks ($59.99) and ebooks ($39.99) are available on Amazon. To purchase the textbooks, click on the links below and be sure to look for the Second Edition texts.